Welcoming a puppy into your home can be the most exciting, happy and sometimes challenging event for you and your family. Excitement levels soar on the approach to collecting your new puppy, and upon his arrival, everyone immediately becomes emotional and enthusiastic, wanting to cuddle him, play with him and feed him. Any pre-agreed rules for your puppy's behaviour can become forgotten and confused. In the excitement, no one fully recognises that he is nibbling fingers, jumping up and creating puddles or worse in the home. My role as a dog behaviourist is to help you plan for your puppy, introduce him to your family in a calm and reassuring manner, and set up a progressive puppy training programme for you to practice in order to maximise on the main socialisation period of your puppy (up to 16 weeks). I also offer puppy visits for people with puppies up to the age of six months if you are experiencing behavioural problems. If your puppy has pet health insurance, my work as a behaviourist may be covered, see my insurance page. Working with you in your home, away from distractions, I can help you with every aspect to help ensure that your puppy grows into a happy, balanced and well socialised young dog free from puppy behaviour problems. Whether you are a first-time puppy owner, someone who hasn’t had a puppy for a very long time or you are want to really give your puppy the best start; I can help. Puppy training visits are not timed as such, but they can last anywhere between two to three hours. I do not clock watch- I’ll stay with you as long as you need me. I use encouraging, gentle and reward based training techniques, helping you develop a loving bond with your puppy. I’ll show you how to reward desirable behaviours and equally, how to ignore and distract your puppy when they are doing something normal for a dog, but in the wrong time or place or directed towards the wrong thing. The better-timed rewards your puppy receives, the quicker he will learn. Occasional verbal corrections are far more meaningful and effective if they are only used when really necessary. The key to effective training is teaching your puppy that whenever he does something wrong, you immediately redirect him to what you want him to do and then reward him for getting it right. Most of all, puppy training needs to be upbeat, consistent and rewarding, in short, regular sessions practiced and integrated into your daily routine. You’ve chosen your puppy from a litter, having seen it with his mother and littermates or taken on the responsibility of a puppy from a dog’s home. Ideally, you should aim to bring him home at the age of 8 weeks, so that he spends the optimum time with his mum and littermates. The last thing he will be learning from his mum and siblings is bite inhibition (more about that later). You should make sure that you know what he is being fed and buy the same food even if you decide you want to change it gradually to an alternative product. You will need to buy and prepare everything your puppy will need in his first few days. It will be comforting for your puppy to take a piece of the bedding used by his mum and littermates so that he has a familiar smell to help him feel secure in his first nights with you. Set up a quiet, draught free area for your puppy to sleep and I recommend using a crate to keep him safe and comfortable at night whilst you are not with him. To minimise the inevitable disruption, keep the crate close to your puppy’s toileting area, away from neighbouring walls and away from other pets until he becomes quiet through the night. A light cover over the crate at night can also help keep your puppy calm. Clear everything away from puppy height to keep your belongings safe. Make sure that everything is in place before collecting your puppy so that when he arrives you can spend as much time focusing on your puppies’ needs and being vigilant for toilet training! You’ve chosen a sleeping area for your puppy close to where he is going to toilet. Give yourself as much time as possible to start toilet training on your puppy’s arrival. The more time you are able to spend being vigilant and judging the time he is most likely to need to relieve himself, the quicker he will get used to toileting in the appropriate place. Your puppy will need regular and quick access to his toilet area and this will usually be after feeding and drinking and about every hour when he is awake. Some dogs need to go more frequently, so take some time to see what your puppy needs. They give very little warning of needing to toilet and you will need to be very patient, never punishing him for performing in the wrong place or making a fuss when you are cleaning up after him. Remain proactive with your routine and he will soon catch on and ask to go outside. - Sniffing and circling on the floor in one spot, especially if it's near the door you've been using to go into the garden or a previously used space. - Sitting or standing at the door (possibly combined with whining) you have been using to go into the garden. - Sudden changes in behaviour, such as stop playing suddenly. - Pawing at the door to go into the garden. - Returning to a previously soiled area in the house. - Sniffing or licking the rear end. Take your puppy outside on a collar and lead to your chosen toilet area and give him an encouraging command to toilet, I use “hurry up”. When he does “hurry up” give him a very cheery well done and make sure he feels happy about what he has achieved. Reinforcing his action in the garden with a high-value treat once he has finished can also help a great deal. You may have to wait a while with him sniffing around. Wait patiently, and cheerfully reward him as soon as he does it to make sure he associates your praise with him toileting. If he starts to wee in the house and you catch his action very quickly, you can pick him up and interrupt the weeing and take him outside. If he continues to wee outside really praise him. Don’t interrupt a poo, as this will really make a mess and upset him. You’ll just need to look for the signs earlier next time! Take him outside to toilet last thing at night and first thing in the morning. Dogs are creatures of habit and the more routine he has in his life, the more straightforward it will be to pre-empt when he will need to toilet. Bladder and bowel control takes a little while for your puppy to develop, so he will make mistakes and as mentioned before, do not punish him when this happens. Patience is the key to developing a nice toileting routine. Make sure that you clear up his outside toilet area on a regular basis to keep it clean and continue to supervise his toileting routine to avoid him developing unwanted habits such as eating his own poo. You need to keep your puppy safe when you are asleep at night and on short occasions during the day when you are busy. A crate is a place where he should feel secure and safe, it is not a place of confinement for you to leave him unattended for long periods of time. Temporary confinement to a small area will inhibit your puppy from soiling. Dogs are denning animals and like to find a confined and cosy place to sleep. Place him in his crate when he is relaxed and tired and stay with him for a while, playing quietly with a toy and then as he begins to sleep, gently move away with minimal fuss. Most puppies will complain a little at first and it is important to ignore whining and only return when they are calm and quiet, even if it is a very short time. This makes sure they learn that making a fuss is not rewarding or will bring you back. Your puppy needs to understand that you’re not abandoning him forever and that there is nothing to worry about. As previously stated, a crate is not a place to lock them up and leave your puppy for extended periods of time. You can gradually build up small periods of time away from your puppy whilst he is happy or sleeping in his crate. You need to ensure that you take your puppy outside to toilet on release from his crate to maximise the opportunity to perform outside. Before placing your puppy in his crate, make sure that he has had the opportunity to wee and poo and ensure that he is not hungry or thirsty. When you know that all their physical needs are met, you can reinforce that whining is not acceptable. Remember, a crate should be used for sensible periods of time so that it is a place of rest and relaxation for your puppy; a safe haven. At night times, I advise that the collar is removed and only a small amount of water is provided and no food is left down for the dog. A puppy often sounds an alarm (whines) when they are separated from us and become afraid. In essence, he is sounding an alarm so that he can be rescued. It is a normal behaviour and most common when he is in a confined space. This whining can worry us, and as a result, when leaving our puppy and hearing a puppy tantrum, we rush back to make sure he is alright; unintentionally rewarding the fuss. You need to be strong and proactive to train your puppy to gradually accept periods of time alone. Do not return back to your puppy when he whines, otherwise, you are rewarding the whining and run the risk of allowing your puppy to control you. When you are at home it is really important to provide regular sessions of play, exercise and training. Thinking and exercise will tire your puppy and they will need lots of sleep. Combine those periods of rest with putting your puppy in his crate to feel safe and you can leave him, building up the periods of time away from him so that he learns that being on his own is ok.
Owners can often make the mistake of conducting a long drawn out departure from their puppy with too much activity and fussing. This can create separation anxiety by exciting your puppy and then for him to feel even more isolated when you leave. If you play with him just before you go out, you are raising his excitement levels and then you leave. He may then use that energy to persuade you to come back (whining and crying), or towards some kind of negative behaviour such as chewing, barking and scrabbling to get out his crate. Make sure you practice putting your puppy in his crate when he is tired so that he can have daytime sleeps in his crate, and leave him quietly without any fuss. The same applies when you return. Take him gently and quietly out of his crate and straight into his toileting area and when he relieves himself, really reward him and make a huge positive fuss. Dogs need to learn to feel comfortable and safe when you are out. In addition to building up periods of time apart very gradually when they are tired and will sleep contentedly, you can also provide them with toys that they can play with and that will keep them occupied such as a Kong stuffed with a little something tasty; they will love that. A dog which readily accepts reasonable periods of time on his own will be happy, self-confident and free from puppy behaviour problems. The events that your puppy experiences will impact on him for the rest of his life as you are helping him through the most important time of his socialisation period. He will continue to refine his social skills quickly up to the age of 16 weeks and of course, will continue to learn and develop as he grows into maturity. A well socialised, well-adjusted dog is going to be your companion for his whole life; able to cope with everything that happens to him without fear or aggression issues. When you first bring your puppy home, he is at his most vulnerable and impressionable. He has left everything he knows and loves and as a result, this first meeting of his new family and new home is really important. Having prepared for his arrival, you now need to allow him to adjust to his new environment, offering him gentle and quiet play and allowing him to get used to his sleeping area when he is tired, leaving him alone for plenty of sleep. Try to establish a routine so that he can quickly understand what to expect. Never smack your puppy, or use harsh reprimands for any common puppy problems. It is much better to divert your puppy from chewing furniture, for example, towards his favourite toy. Praise him as soon as he starts playing with his toy. He will quickly understand, but supervision is key! Ensure that new experiences are positive in the home environment, such as introducing him to healthy, well- adjusted dogs, visiting friends, and new noises and objects that he may not have encountered before. Introduce a soft puppy collar and light lead (no chains). He may fuss when he starts to wear a collar, but distract him with his favourite toy or put it on prior to feeding times and he will soon forget he is wearing it. Put a lead on your puppy to drag around the room and make sure that you are supervising him to avoid him being caught or tangled on the furniture. When your puppy is happy in his home environment you can take him out, carrying him if necessary, (subject to his vaccinations) to introduce him to schools, shopping centres, parks, local places of interest, and general noise and people. Enjoy short and frequent rides in the car; making sure that your puppy is secure and comfortable for travelling. Avoid car travel an hour either side of a meal. When your puppy is relaxed, introduce him to being gently groomed, feet thoroughly examined graduating to clipping nails, a full inspection of his teeth and cleaning his ears. You should be able to handle your dog from tip to toe after some practice. Most importantly, wherever possible avoid exposing your puppy to any experiences that might frighten or overwhelm him. Take everything at the pace your puppy is happy with. Keep all new learning experiences short, positive and full of praise for calm and accepting puppy behaviour. Chewing and biting are natural puppy behaviours, as they use their mouths to explore and taste things. It can also relieve sore gums. This article of 'biting and nipping problems with dogs' looks at this specific problem in more detail. The puppy will start to learn not to bite (bite inhibition) from his mum and littermates and as their new owner; your role is to develop their bite inhibition so that they do not grow into a dog that bites people or other dogs. I have a simple rule that no puppy teeth should touch human skin or clothing at any time. Even playful early nips can hurt, particularly for a young or elderly person and should be one of the most important lessons for your young pup. Each puppy is different, but techniques for stopping a puppy nip or chew usually fall into two categories. Firstly, when his teeth touch your skin, imitating what his mum would do with a clear “ow” exclamation and then although staying with him, stop touching or interacting with him until he is calm. However, if your puppy is excited and persistent, make an “Ow!” exclamation but this time, as soon as he nips you, abruptly leave the room, or place the puppy alone in the confinement of his safe play area and only returning when he is calm. Avoid over exciting your puppy during play and avoid rough play. These are the most common reasons for a puppy to forget any prior understanding of bite inhibition; potentially leading to aggressive puppy behaviour. Your breeder will ensure that you know what your puppy has been eating so that you can continue with the same food when you bring your puppy home. If you want to change his food, it is important to make any changes very slowly, over the period of a week, to avoid any tummy upsets. I recommend and feed my own dogs Forthglade. A young puppy, up to the age of 16 weeks, will need feeding four times a day at regular intervals, with a food formulated specifically for puppies to support their physical development. At the age of 16 weeks, your puppy can be fed 3 meals a day until the age of 6 months when he can be reduced down to 2 meals a day. Two meals a day is a good routine for feeding for the rest of their lives. All of these choices have various pros and cons depending on your dog's individual needs, along with your time and inclination. I would be pleased to help you work through this minefield. Which type of food you choose is personal preference, but make sure that it is formulated to give your puppy what he needs for healthy development and the best that you can reasonably afford. In any event, do ensure you avoid all artificial additives. Make sure that your puppy has access to clean water at all times in a heavy bowl that he can’t knock over. When you give him his food, allow him to eat in peace away from children, any undue activity and other pets. Do not remove the food from him when he is eating, as this could cause food guarding which could progress to aggression. Adding food whilst he is eating is a more valued way of ensuring that he accepts your interaction and presence at food time. If he leaves any food, take the bowl away from him after a few minutes. If he continues to leave food, you may be feeding him more than he requires. I would advise that you do not choose to feed your dog from your own meal or dining table. There are often ingredients in human food that are harmful for dogs, such as onion or salt for example. You do not want your dog begging for food whilst you are eating and so the best way to give him a treat such as a small piece of meat is to add it to his own food at his own dinnertime. Your puppy will often jump up through excitement, wanting to say hello and to get close to your face. When they are very small, we often inadvertently encourage this puppy behaviour by rewarding your puppy with an affectionate greeting, only to get increasingly annoyed when they become heavier and hurt you as they continue to jump up. Provide your puppy with an alternative way of greeting you, which is rewarding for both of you, and this will become a habit that will be appreciated by everyone your dog meets. Teach your puppy that a sit in front of you on your return will result in an affectionate hello. To start this process, kneel down in front of your puppy on your return to him, asking him to sit and gently putting a finger under his collar to hold the position. He will quickly understand that sitting calmly in front of you will be the quickest way to receive love and affection. This behaviour is really useful when walking your dog in public, because no one enjoys muddy paws all over their trousers, whatever they tell you! Make sure that you ask everyone in the home who interacts with your puppy to ask him to sit before greetings and be sure that you are shadowing your pup closely in public spaces so that you can direct those meetings calmly. Consistency really is the key. In terms of training related areas that can cause worry and frustration, it must be the lack of puppy recall, which tops the list. The best time to set up sound recall practice is with the first outings with your puppy. Dogs that do not recall (some may actively run away! ), present a danger both to themselves and the unsuspecting public such as a motorist on a public road. Dogs that are allowed to practice running freely, having fun in public without an effective recall can learn that ignoring their owner is more rewarding than coming back when called. Young dogs think more in terms of short-term pleasure and the temptation to explore the world thinking that everyone wants to play with them is their priority. The owner will become frustrated and when the dog does eventually come back, they tell the dog off and this merely confirms to the dog that coming back really was a bad idea! With a new puppy, you will have every opportunity to teach him to come back to you every time and that doing so will be rewarded, with a pat, or a tasty treat. You can introduce the puppy recall with a hungry puppy in the home, by carrying out a short calling of his name as a helper briefly holds him at a distance before letting him go and allowing him to eat a meal. You can also carry out many more mini-recalls in the day to develop this skill. Have a handful of his favourite treats and give him a couple to show him what you have to offer. Stand one or two paces back from him and then issue your call of his name in a bright voice combined with your open body language. He will run to you and as he approaches, welcome him cheerily towards you and give him the treat at your feet. Be sure to use a bright, clear voice combined with open arms to help guide him in. Refine his arrival gradually into a sitting position to receive the treat, looping your finger gently under his collar keeping him in the sit until he is released. The next stage is to increase the distance of the recall within your home environment without unnecessary distractions. You can use a long line attached to his collar on one end and in your hand on the other. If he becomes distracted on his way to you, a gentle tug on the line will remind him to come to you straight away as you double your efforts with your bright encouragement. Only once his puppy recall is reliable within the home and garden, should you start these exercises in a public space. Do not feel tempted to allow your dog to charge about off the lead in a park for example, until you are confident that he will recall effectively. Prevention of a “not coming back” habit is much easier than curing the bad habit. As a responsible owner you are ultimately liable for any such accidents and their outcome, so you can see how the simple act of not returning when called can have multiple and potentially severe consequences. Non-recalling dogs are also in my experience more likely to become involved with aggressive behaviour once they are beyond your immediate control because you are not able to have a direct influence on how your dog is behaving in various circumstances. This is a common puppy problem and can be easily averted with some forethought. It will only take a short period of time for your puppy to get used to a soft puppy collar. Distract your puppy with his favourite toy and some tasty treats and within minutes he will forget all about the collar and be completely unaware of wearing it. You can take it on and off a few times each day so that the experience is gradually built up. Your puppy should wear an identification tag on his collar with your contact details. Put a light fabric lead on him within a confined area of your house and allow him to drag it around. Stay with him to make sure that he doesn’t become tangled in furniture and hurt himself. Once he is comfortable dragging the lead behind him, pick up the other end and follow him around. Eventually, whilst on the lead, entice him towards you without any pulling or tugging. Use a toy or some training treats to encourage your puppy towards you and to start walking alongside you in a loose manner. Graduate this training to the garden and eventually to a public area where he will have more distractions. Pulling is a natural behaviour for your puppy, feeling a restraint and pulling against it. Practice walking your puppy on his lead in the house where there are no distractions. Get your puppy used to walking at your side for very short periods, encouraging him with a favourite toy or treat, trying to keep the lead loose at all times. Keep your puppy on your left side, or the right if more comfortable, but don’t swap sides to avoid tripping over him. If your puppy rushes ahead, just stop and encourage him back to you. Only move forwards again when he is calm and the lead is slack. If he is persistently pulling, just slowly turn and reverse your direction so that he turns as well to catch up and follow you. Do not yank the lead as your puppy’s neck and throat are very sensitive. As a result of this technique, as long as you are consistent, your puppy will learn that pulling is a waste of effort and will happily walk happily by your side as you offer verbal rewards and lots of encouragement. A puppy will usually bark when they are lonely, bored, frustrated or frightened. He may have learned to bark to gain your attention, by for example, sitting by the back door to go out, or wanting a fuss. Making sure that you give your puppy undivided periods of attention for play/exercise and training should prevent some of the reasons that he barks at a nuisance level. Sometimes, your puppy could be confused about whether barking is a good or a bad thing. You may reward him if he barks at a stranger approaching the house then reprimand him for barking at a friend entering your home. An alternative is to train your dog that barking is alright until he is told to stop. A command “stop barking” with a treat extended will encourage your dog to stop barking in order to take the treat. He will not be able to take the treat and bark at the same time. Praise your puppy whilst he is licking or sniffing the treat and not barking whilst repeating your command such as “no barking”. Each time he is told to stop barking and he does, he will be given a treat, leading to good puppy behaviour in no time at all. Submissive urination is a normal behaviour for a puppy, and it is how they to demonstrate submission. Puppies usually submissively urinate when they greet you in an excited fashion and it is the ultimate demonstration of respect and deference to you! It is normally a problem with young puppies which haven’t yet perfected their social skills or with older puppies when they are a little insecure. The best method of dealing with submissive urination is to completely ignore it; avoid greeting the dog happily if he urinates, as your puppy will interpret this as praise and do it more. The reverse is also true as by telling your puppy off, he will feel bad and do it more to apologise. The best method to avoid submissive urination is to train your dog to greet you in a different way, again sitting at your feet is a good option and should deter your puppy from being able to relieve himself at your feet. You can practice greetings and reduce excitement levels in your puppy by repeating the process. Enter the house, allow a greeting and if he urinates ignore it, leave the house and repeat. Eventually, he will become calmer and not feel the need to relieve himself, sit in front of you and at this point you can give him a rewarding and gentle fuss whilst keeping his excitement levels contained. Puppies will find the act of chewing relaxing and enjoyable, whether through feeling bored, frustrated or even just with sore gums. Until he can be trusted, your role is to restrict access to items and areas you do not want your puppy to chew and to provide him with toys that he is welcome to chew. You can make his toys extra excitable by using food. Choose a Kong style hollow toy and stuff it with something really tasty and healthy. This will occupy him for some time and prevent him from choosing to chew on a table leg for example. You can create exciting games for your puppy by hiding his favourite toy within sight initially (under a cushion for example) and training him to look for it, making it increasingly hard to find as he develops his ‘finding’ skills. "Hi Nick. Thank you for the puppy training session I had with you recently and would like you to know how much it has enhanced my relationship with my Jack Russell puppy. The session made me realise that although I have owned dogs for many years, it was my behaviour and my partners that needed addressing as much as the dog's.The change has been instant, and I have had so many friends and family tell me how much Jimmy has changed for the better as he was starting to get out of control. This really was the best Christmas present I have ever had and I would strongly recommend you to anyone who has a dog that is taking over. Thank you again, Alan." "Thanks so much for your puppy behaviour consultation yesterday and for confirming it all in writing. We have had a very enjoyable day with Charlie today. I put him in his crate this morning while I got the kids ready. He was happy to go and as a result we had a much more stress free morning. I took away the puppy pads and have taken him outside every hour using treats as a reward when he goes and so far no accidents for the first day yet !!!! He is already happy to sit and wait by the door. I'm absolutely over the moon at how well he's responded to your suggestions, and I feel much better being in control. So thanks once again." Dave & Helen. 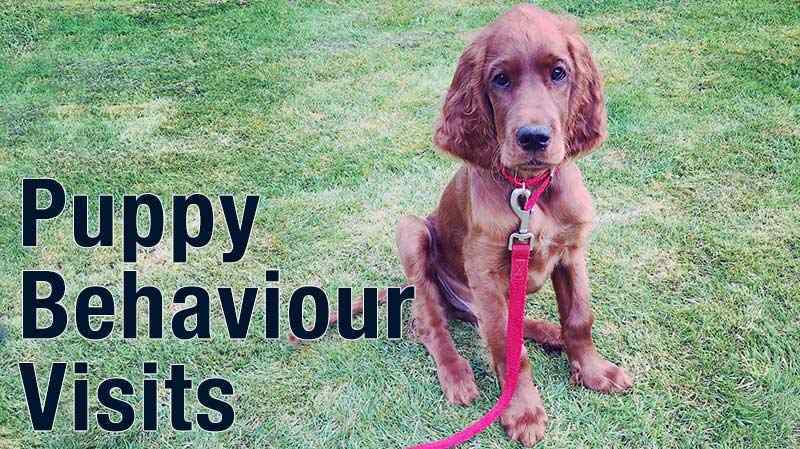 "Just wanted to thank you for all your help with Molly and her puppy behaviours. Since your first visit Molly is a much more settled puppy and more importantly we feel more in control. We found the immediate transformation in her quite remarkable. She is now much calmer in the house and no longer biting us which has enabled us to start some puppy training with her. Through your guidance we are now able to walk her on a short lead in her obedience class and are no longer having to deal with her jumping up, biting and grabbing hold of the lead. (The class leader is also amazed by the difference in her). We would also like to thank you for encouraging us to crate train her as this has been invaluable. We would not hesitate in recommending you to anyone who has a problem with their dog, we found you to be very understanding and knowledgeable. It is a comfort knowing that we are able to contact you at any time for further advice should we need it. Many thanks the Roberts family." "Hello Nick, since your puppy training visit he's been introduced to so much new stuff - the lead, walking, strangers, other dogs, cats, rabbits etc and he's been an absolute legend. We're using your advice about keeping a lead on him and such a simple thing has changed our whole approach, we can control him without him mistaking it for play. The tie up point is in place in the lounge and he knows he can only go in if he's super calm. Yesterday he sat in his bed in there for two hours without a single mistake; it was like he was plastic! More than anything we want to thank you for reminding us he is a dog, not a human and his needs are very different. With your three hours teaching we are so much happier and have a happy balanced puppy that is so well behaved that everyone we meet is amazed he's so young. He's still a bit ‘bitey’ on the clothing, but we're using the calm and helpful method you taught us and are making excellent progress. We'll keep you updated on our progress but thanks again for your excellent advice. Regards, The Harrisons.